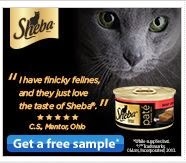 Get a free sample of Sheba Cat Food. Click the link below to go to their website. Once on the website click on the picture above where it says, "Get a free sample." Once you are on the next page fill in your mailing information to get your free sample.